Italian methods of education have led the way in child-centered education which takes into account the child’s unique ideas, preferences, learning styles, characteristics, motivations, and interests. Italy was also the first country to adopt a single-track educational system focused on the full participation of all students irrespective of disability. 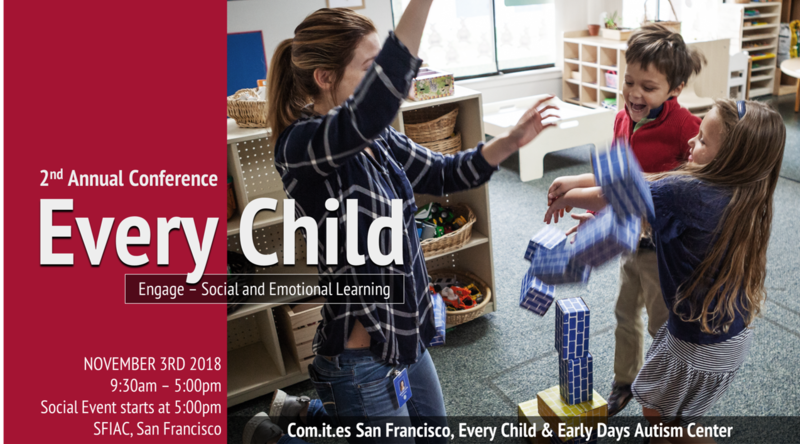 Last year, Comites SF partnered with Early Days Autism Center to bring together a full day conference focused broadly on inclusion, early education and the young student with Autism Spectrum Disorder. This year the Every Child Conference’s theme is ENGAGE and will concentrate on Italian education methods, inclusive practice, and social and emotional development. The aim is to promote educational attainment and social inclusion of every single student through the core principles of inclusion: social interaction and social participation. Click here for further details. 5:30 – 7:30 Social Event – Live performances, Italian food, silent auction, and raffle! CERTIFICATES AVAILABLE: teachers, therapists, and instructional assistants can receive a Certificate of Attendance in order to request professional development credits from their county. Click here to read the bio and abstract of our speakers.